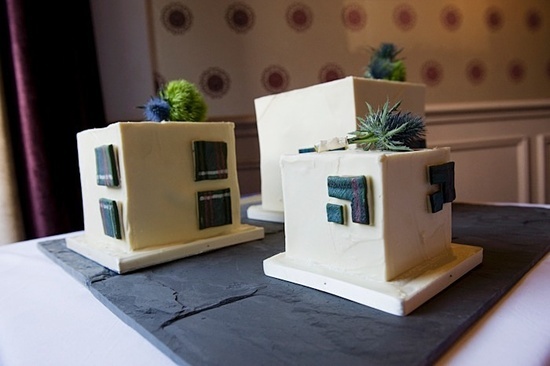 Unusual wedding cakes can be so much fun. Surprise your guests with a grand finale that they will remember and talk about for years to come. 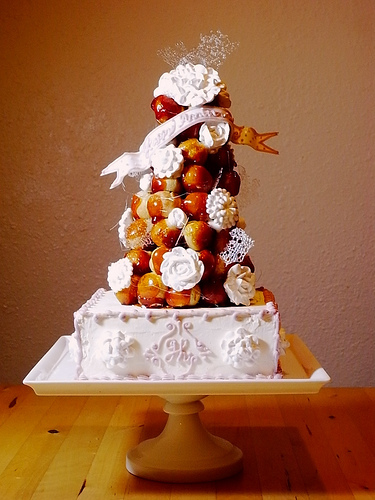 Croquembouche is an elegant and unusual way to make a wedding cake. It's made up of small round puffs called profiteroles or cream puffs. They are filled with pastry cream or mousse and then caramelized. The little puffs are then piled high into a cone shape and decorated. 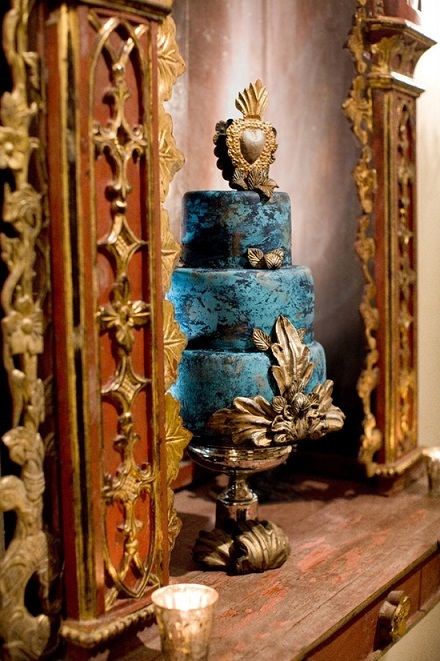 This wedding cake by Butterflies & Angels is definitely different. Click on the photo to go to their website, which is chock full of fabulous and unique designs that you will not see anywhere else. 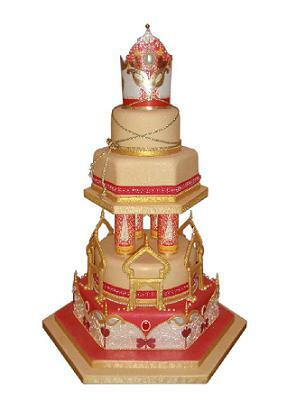 This unusual wedding cake really caught my eye. The classic white brides confection has always been traditional. If you want to shock and delight your guests why not go for chocolate. What a unique idea. I had not thought of this deign. 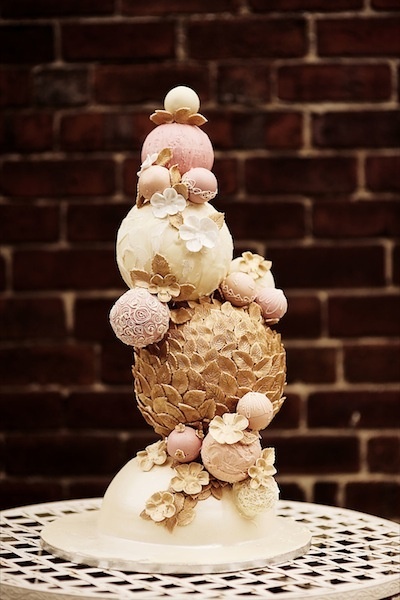 This beautiful and unusual wedding cake was shared with me by Alana and I simply love it. It is done by swirling melted chocolate onto waxed or parchment paper which is wrapped around a pan I believe to give it the curves. Then allowed to cool in the fridge. Once cooled it can be peeled off the paper and placed on the cake. I imagine you would have to make sections to create the illusion of one continuous piece. That is how I believe Alana did this, but feel free to go and LIKE her facebook page and maybe she would tell you exactly how she did it. 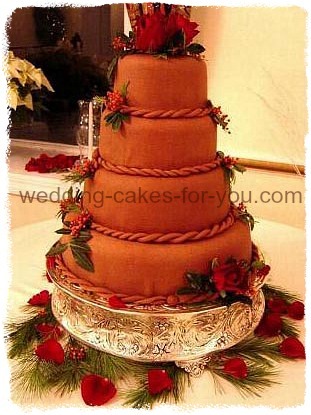 This particular one below is a winter wedding cake as you can tell by the use of pine needles, holly and red rose petals. But of course you can change the flowers and give it a whole new look and feel. Another way to incorporate chocolate into your wedding reception is with a grooms dessert. 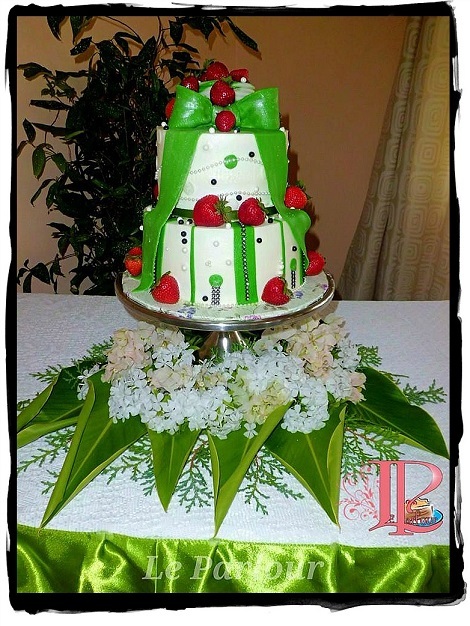 This beauty is so unique in the bright colors which are displayed on the cake and the unusual floral arrangement around the pedestal. They have a very distinct style. I am so loving their creations. This is what I call triple chocolate. Not only was the cake chocolate but the filling and the outer coating was a dark rich chocolate too. 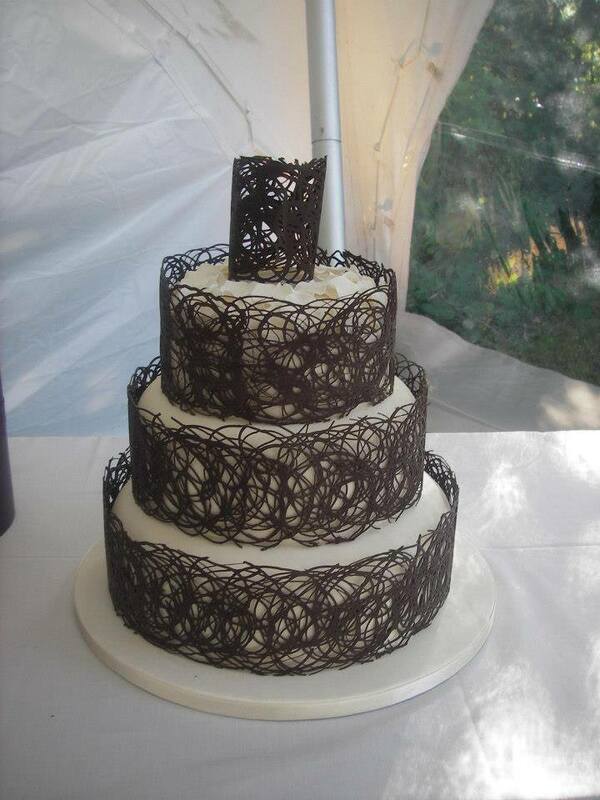 Ganache is an unusual way to cover a wedding cake. But if you are a choc-aholic, why not let your guests know about it. 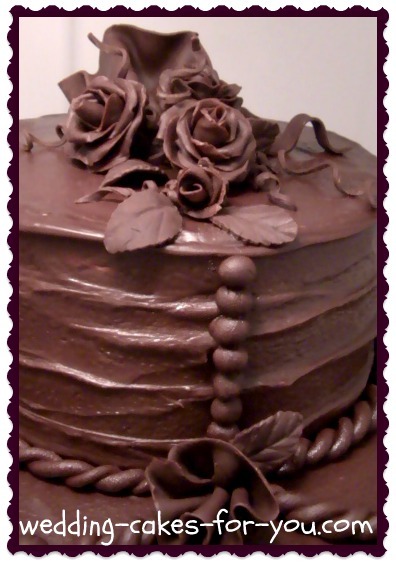 I have yet to see a wedding reception crowd disappointed with a chocolate wedding cake. Rolled fondant is really fun to work with because you can get very creative with it, as you can see. You can literally roll the sugar dough into any shape you desire. 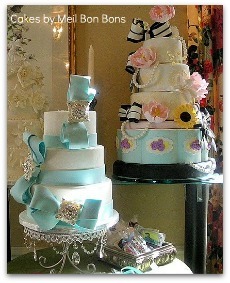 Making a fondant wedding cake does not have to be difficult. With practice you can do it too. Check out the fondant tutorials.